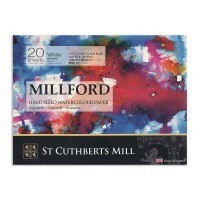 The newest paper developed by St Cuthburts Mill, Millford was designed to replace the now discontinued Whatman paper. \just like Whatman, it is 100% Cotton and mould made. It has been made to havae a high resistance to water mening that washes perform very differently on it compared to traditional watercolour papers.